The Red Raiders are moving away from the air raid after hiring Matt Wells from Utah State. 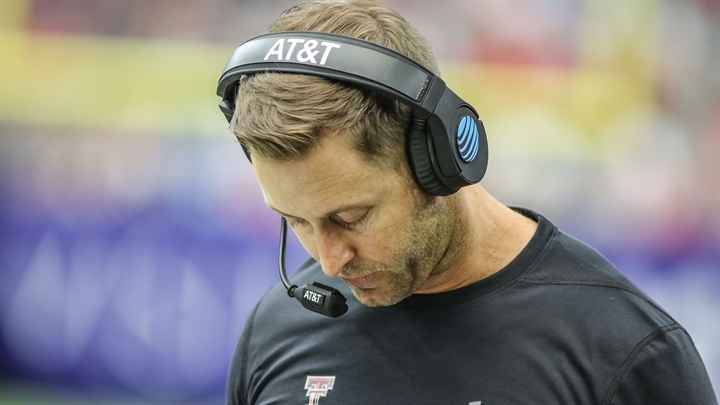 When Texas Tech hired Kliff Kingsbury in 2013, he was hailed as an offensive innovator. Kingsbury lived up to that part of the message, but still failed to bring consistent success to Lubbock. The 2018 season was a perfect microcosm of those frustrations. The Red Raiders got off to a quick start, but struggled to finish late in big games. Quarterback Alan Bowman threw for a boatload of yards in his limited starts, but the offense struggled when he got hurt. Ultimately, the program opted to head in a different reaction. Now, the Red Raiders are heading in a new direction. Head coach Matt Wells just led Utah State, one of the worst programs in the FBS, to a 10-win season. Now, he will have to impart his culture and vision on a new program in Lubbock. Here’s our full postmortem and review of the 2018 Texas Tech Red Raiders football season. Because of injuries, the Red Raiders started three different quarterbacks over the course of the season. That didn’t bother Wesley one bit. The 6-foot-5 junior finished second nationally with 117.5 receiving yards per game and posted six 100-yard games. The junior posted a pair of 100-yard games while receiving passes from Jett Duffey, and added a 261-yard game when Alan Bowman was under center. Texas Tech’s defense didn’t make the giant leap some hoped, but still improved tremendously. When Allen and safety Jah’Shawn Johnson were on the field together, the defense looked outright special at times. Despite missing time with injuries, Allen finished second on the team with 73 tackles, 6.5 tackles for loss and five quarterback hurries. He should develop nicely into a contributor at the next level. Texas Tech started the year 5-2 after impressive games early in the year. There was quite a bit of optimism. With five games remaining, the Red Raiders needed just one game to make a bowl game. The potential was clearly there for a special season. But in the last five weeks, everything fell apart. It started with a tough loss against Iowa State, where the Red Raiders blew a 10-0 first quarter lead. Back-to-back losses against Texas and Oklahoma by one possession were disappointing, but not unexpected. The last two weeks spelled the end of this era of Texas Tech football. The Red Raiders were crushed 21-6 by a bad Kansas State team, and lost by double-digits against a Baylor team still fighting for bowl eligibility. After the 5-2 start, Kingsbury seemed to have played himself off of the hot seat. By the end of the year, Kingsbury managed to burn all the goodwill. Making a bowl game might have been enough to save his job, and seven wins would have eased the pressure significantly. Missing a bowl game with a five-win head start is unconscionable. Without quarterbacks Alan Bowman and McLane Carter, Texas Tech seemed like a goner. TCU had all the motivation in the world to take it to Tech after losing tight games against Ohio State and Texas. But on a chilly night in Fort Worth, Texas Tech’s defense stood tall. Texas Tech scored only 17 points. That was enough to win. The Red Raiders forced three turnovers, seven points, a missed field goal and a turnover on downs in one of the best defensive efforts of the Kingsbury era. Jett Duffey ran for 83 yards and a touchdown, and that was enough to narrowly beat TCU. Obviously, TCU ended up being worse than expected. The Horned Frogs’ collapse meant this win aged fairly poorly. But still, at that moment, anything seemed possible. Everything that happened to Texas Tech through the first 10 weeks of the season was completely defensible. Losing to Oklahoma, Texas and West Virginia by one score was unfortunate, but it happens. Running out of steam against Iowa State on the road happens. 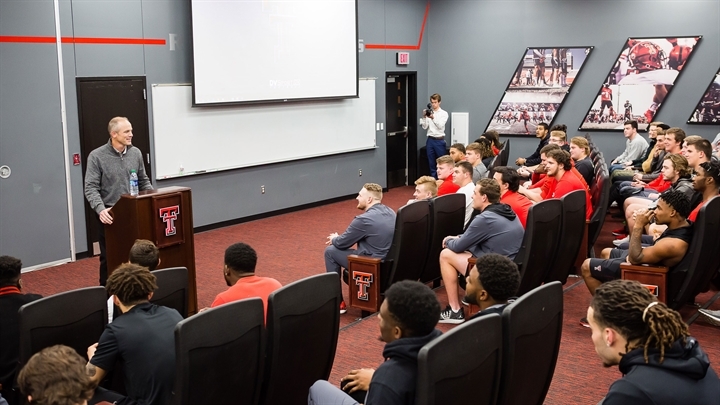 That all changed when the Red Raiders traveled to Manhattan, Kan., on a freezing Nov. 17, 2019, day. One of the worst Kansas State teams of Bill Snyder’s second era absolutely punked the young Red Raiders. After Texas Tech scored a pair of field goals in the opening quarter, the Wildcats pounced. Kansas State held Texas Tech to an embarrassing 181 total yards, including 31 yards on 1.2 yards per carry on the ground. It was a frustrating and disappointing performance against a Wildcats team that did nothing well in Bill Snyder’s final season. Biggest offseason question: Can Matt Wells build relationships in the state? When Kirby Hocutt opted to go from Kliff Kingsbury to Matt Wells, he picked a completely new direction for the program. Kingsbury was a high-powered air raid offense; Wells emphasizes defense and toughness in building the culture of a program. When an out-of-state coach is hired, the first question is natural – how will he recruit Texas? With Wells, that’s a perfectly legitimate question. Seven of his assistants came with him from Utah State. Defensive backs coach Kerry Cooks – who came from Oklahoma – is the only one who has recently recruited the state consistently. Wells will have to quickly make inroads with high school coaches in the state. Tech never recruited well under Kingsbury. You have to go all the way back to Tommy Tuberville to find a coach who reeled in top 30 classes. Even in those classes, plenty of players transferred. Wells has to turn that tide and build trust among Texas coaches and recruits to have a shot at Texas Tech. In many ways, the 2018 season is going to be considered the end of an era in Lubbock. Mike Leach brought the air raid to Lubbock almost 15 years ago. While new offensive coordinator David Yost employs some air raid concepts, he’s a spread coach at heart. Kingsbury’s final year was a disappointing way to end such an influential era. He found a quarterback of the future in Alan Bowman and turned an unproven receiver into an All-American. But on the other end, Texas Tech lost embarrassing games and failed to make a bowl for the third time in six seasons. Ultimately, athletic director Kirby Hocutt had enough. The Red Raiders had opportunities to hire other air raid aficionados, like Seth Littrell or Eric Morris. Now, the burden is on Matt Wells to prove that Texas Tech can be a successful football program in another way.